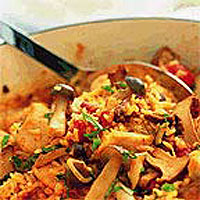 Seasonal wild mushrooms will help to create a meal that is just a little unusual. A pack of Wild Mushroom Selection includes Girolle and Pied Bleu. They are used in this one-pot dish that needs only a large salad to accompany it. Preheat the oven to 190°C, gas mark 5. Heat the oil in a large, flameproof casserole dish with at least 3-litre capacity and a tight-fitting lid. Fry the onions and lardons or bacon for about 7-8 minutes, until soft and tinged brown. Push the bacon and onions to the side of the pan, add the chicken and fry for 3-4 minutes, until lightly browned on all sides. Add the rice and stir until all the grains are evenly coated in the oil. Pour the stock into the pan and add the tomatoes, mushrooms and seasoning, stirring well. Bring to the boil, cover tightly with the lid and transfer to the oven for30-35 minutes, until the rice is tender and the stock is absorbed. Gently stir in the basil and serve sprinkled with freshly grated Parmigiano-Reggiano and a large green salad. Make a few hours in advance to the end of step 3, then set aside to cool. When you are ready to cook, return it to the boil and continue from step 4.